I am sitting here in my office, for the last time, beginning to write this. People say that time flies, but the degree to which I feel the truth of this statement right now is incredible. Did I not just get off that plane and arrive to find out that my luggage was not in Ben Gurion airport, but was rather sitting patiently in Newark, New Jersey? I know. Not the best start. But believe me, it looked up from there. But no, that was not yesterday. That was two months ago and now it is almost time for me to get on that 12 hour plane ride back to Boston. This summer has been incredible, both professionally and personally and I am so grateful for the experience that I had. It is incredible when a foreign place no longer feels like that, but rather feels like a home. The HaNamal street that I leave no longer feels like HaNamal street in Haifa; it feels like the street outside of my apartment. I am unbelievably sad to leave my home, but I also know that it will be there when I come back one day. The second half of my summer was a lot like my first. The main difference was that I felt a lot more comfortable in the work environment and in Haifa at large. I finished up working at the Achva Camp, saying goodbye to some of the most precious kids I have ever met. I continued to work on compiling grant research. I helped to draft outreach letters to some of the foundations that I had gathered information on. 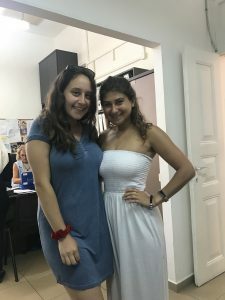 I worked on an informative and engaging program about intercultural understanding with a fellow intern for ten 15-year old Israelis who were going to come to visit and learn about Beit Ha’Gefen. When the day for the program came, only two of the kids ended up showing up with their counselor. From this, I learned that in organizations, sometimes not everything goes as planned, and that is ok. My co-intern and I still had an amazing day, meeting with these two 15-year old Ethiopian Israelis who wanted to practice their English with us and learn about Beit Ha’Gefen. Furthermore, I continued to utilize my English skills to help staff around the office with English emails and content. I explored Wadi Nisnas and was able to experience all the beautiful artwork that Beit Ha’Gefen helped to make possible in this neighborhood. I grew not only professionally, but personally. I had always been told that living on your own in a foreign country for a substantial amount of time will change you, but until I experienced it firsthand, I did not fully realize how true this is. I felt myself becoming so much more confident and competent. It really did feel like some kind of stepping stone to my next stage in life; I feel less nervous for the future and more sure that I am ready for whatever is to come. Outside of the office, I did a lot more traveling around Israel. I visited Tel Aviv and Jerusalem a few times and went to the beach as much as I could. I continued to strengthen the friendships that I had made throughout this summer. One of the highlights for me from the second half of the trip was a day trip that a few friends and I took to this river spot called the Yardenit, which is at the Southern tip of the Sea of Galilee. We had a Sunday off of work and my friends and I decided that we wanted to do utilize our day off and do something cool. It was the perfect destination. We laid out a tapestry by the water and brought a little picnic for ourselves, as well as a speaker so we could enjoy music, the view, and food. We alternated between hanging out on the side of the river and swimming in the water. The water is a stunning turquoise color and was just the right temperature. There were ledges to jump off of and ropes to swing from. Let’s just say I am not Tarzan; but it was fun to try! There is so much that this summer offered me that I cannot put into words, and certainly cannot put into this short blogpost. I am so unbelievably thankful that I was able to have this experience this summer. I am already thinking about when I will be able to go back! This trip has gone by so fast! I can’t believe that I’m flying back to America in a few hours. The second half of the trip was even better than the first half! I experienced a lot of new things and had a lot of interesting experiences while I was here that I will never forget. In my lab, we got the results of my experiment. The first time we ran the gel, the results were compromised due to the use of chloroform as a solvent for the beta carotene. Luckily, my grad student Ronit found a way to solubilize the beta carotene without using chloroform, and we redid the experiment the next week with the correctly solubilized beta carotene. We found out that beta carotene does not affect Complex 3 of the mitochondria like astaxanthin does, and we set up another experiment (to be continued after I leave) that tests the effect on respiration of C. elegans by measuring its lifespan. The last week I was here, I extracted more mitochondria to replenish the stock that was used during the experimentation. I absolutely loved my internship and wouldn’t trade it for the world! Everyone who worked in my lab during my internship. Outside of the internship, I did a lot of fun things in the last two and a half weeks. The third week of the trip, the Birthright trip from Brandeis was here and a lot of my friends were on it. They had a night out in Jerusalem, and I visited one of my best friends in Mahane Yehuda, Jerusalem’s largest outdoor shuk. We were able to catch up and talk about what we had been doing so far this summer, and it was great to see her after so long. Another one of my friends extended his trip after Birthright to stay for another Onward Israel program, so we have been hanging out and exploring the city a lot! Me and my friends celebrating Shabbat at the Western Wall. One of the highlights of the trip for me was going to the Dead Sea. 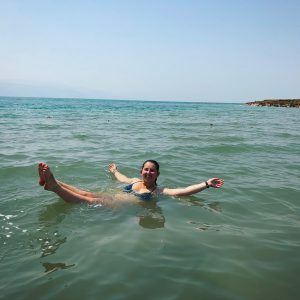 The fourth Friday of the trip, my camp friends and I took a bus from Jerusalem’s central bus station to the Dead Sea, and we went to a beach/resort that had a pool and areas for us to relax outside of just the typical things you do at the Dead Sea. We got there at 9:30am, and the first thing we did was go down to the Dead Sea and float and cover ourselves with mud. It was nice and relaxing, but all of the cuts and hangnails that I had stung when they hit the water. After we were done in the Dead Sea, we headed up to the resort area and spent the rest of the day by the pool. The pool had parts in the sun and the shade, and we alternated between those spots when we were swimming. We also spent a lot of time in the sun, and I got a really nice tan! We took a taxi back to Jerusalem at 3:30 and spent the rest of the day relaxing in our apartments. That day was so much fun, and I’m so glad I could go! Me floating in the Dead Sea during one of my free weekends. Hi everyone! 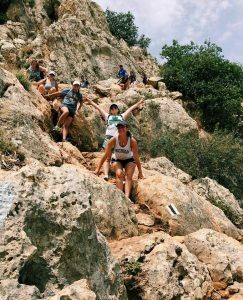 I’m Haley, and I’m super excited to be sharing my experiences in Israel with you! 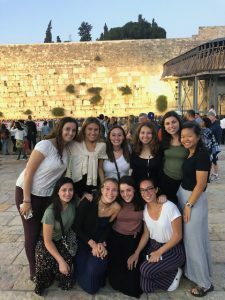 I’m in Jerusalem as part of the Onward Israel Camp Counselor program, which gives summer camp counselors the opportunity to have an internship for five weeks in Israel before returning to camp and working as a counselor. This is a unique program because everyone here is working at an overnight camp across America. The majority of our internships are in Jerusalem, and we are living in apartments in the Bak’a neighborhood of Jerusalem. Part of the program is matching us with internships that are relevant to our majors and our interests after we complete our undergraduate degree. I am a biology and chemical biology major with a minor in Spanish, and the program gave me an internship based on my interest in genetics. Everyone on my Onward Israel program! 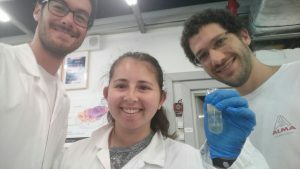 My internship is in a genetics lab at Hebrew University, and I have been working there for two and a half weeks now. There are two other interns in this lab, and we are all working in different labs helping a masters’ student complete projects. My project is on the effect of beta carotene on the respiration of cauliflower mitochondria because my grad student did an experiment with a different carotene pigment and found that Complex 3 of the mitochondria was lost. Last week, I harvested the mitochondria and prepared them for the experiment, and this week, we cast the gel and ran the experiment. The work week here is from Sunday to Thursday, so we normally have Fridays and Saturdays off. Two of the lab techs and I taking a “mito-selfie” with the mitochondria we harvested. Not only am I doing a lot in my internship, I have a lot of time to explore Israel and see what it has to offer. The first weekend we were here, it was Shavuot, so we had a three-day weekend. I decided to visit one of my friends who lives outside of Haifa, who would pick me up Friday night. She is an Arab Israeli, so I got to experience Ramadan with her and her family. It was a really cool experience, especially because I’d never been to an Arab village in Israel or experienced Arab culture firsthand. We did a lot of fun things that weekend, like go to the beach and go shopping around her village, and she showed me her favorite shawarma place (so of course I had to try some!). 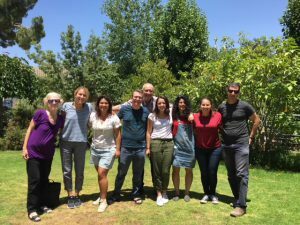 Onward had programming for us last Thursday through Saturday, so we all had work off on Thursday to take a tour of Haifa and go on a retreat at a kibbutz in the Galilee. That weekend, I hiked Mount Arbel and visited an anthroposophical kibbutz before celebrating Shabbat with all of the Onward groups currently in Israel. Right now, it’s just us and two other groups – one from Montreal and one from Toronto. We all learned about each other and participated in a variety of activities that expanded our viewpoint on the world. Me and my friends hiking Mount Arbel (I’m in the back in the Nantucket tank top). Another part of our program is meeting with the Israeli shlichim (counselors) that are coming to our camps as international counselors this summer. 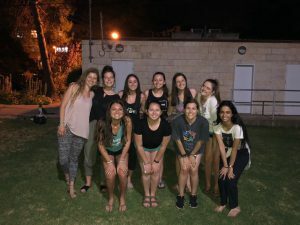 Last Monday, I met three out of the five shlichim that are coming to my camp, and we got dinner with two of them on Tuesday because they were in Jerusalem getting their visas. My camp friends and I spent a long time talking about what to expect at camp and getting to know them, and we’re really excited to see them again and spend time with them at camp. All of the Onward participants from my camp and three of our Israeli shlichim! This has been an amazing experience so far, and I’m so excited to see what the rest of this experience has in store! Every morning when I step outside my apartment, conveniently located downtown, an area with plenty of restaurants and bars to hang out at, I am immediately greeted by the vivacious, bustling city that is Haifa. Because of my previous connection to Haifa through the Diller Teen Fellows Program, I decided that this is where I wanted to spend my summer. It is hard to believe that my summer is already halfway over. My love for Haifa, a city I was only remotely familiar with before this summer, has grown tenfold in the few weeks that I have been here. I believe that Haifa is one of the more underrated cities in Israel. It is not only home to the stunning Bahai Gardens, but it is unique in that it is a mixed city where Arabs and Jews live side by side. 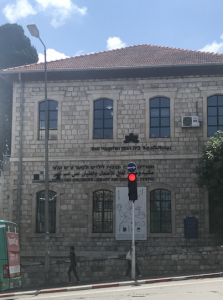 Because I wanted to learn more about Arab-Jewish coexistence efforts throughout Israel, I decided to intern at Beit Ha’Gefen, an Arab-Jewish Cultural Center in Haifa. Beit Ha’Gefen strives to promote shared living and mutual understanding between Arabs and Jews through art galleries, workshops, Arab-Jewish youth groups, theater, festivals, and more. It is home to the Clore Library & Cultural Center, the only library in Haifa that contains thousands of books in Arabic alongside Hebrew and English. Beit Ha’Gefen is an incredible organization that is not afraid to ask tough questions and try to promote dialogue and coexistence through a medium that everyone can relate to regardless of religion or nationality; art. 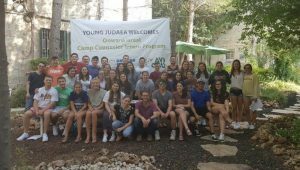 My internship at Beit Ha’Gefen has been exactly what I wanted out of this summer; it has given me the opportunity to learn about the inner workings of a nonprofit organization, meet people of all backgrounds, and learn about coexistence efforts in Haifa. My internship consists primarily of two parts. Some of the time I am doing administrative work, such as grant research, translations, and generally helping out around the office. 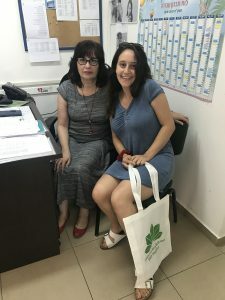 I have also been able to sit in and participate in fascinating workshops and tours that Beit Ha’Gefen gives to various groups that come to learn about the organization. The other bulk of the time, I am helping out at The Achva School, an Arab summer camp located in Wadi Nisnas. 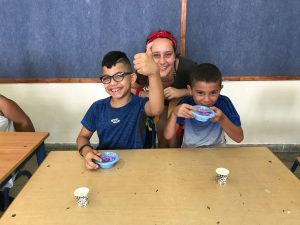 Working at the summer camp is exhausting but rewarding; the kids I am working with know little to no English, and I do not speak Arabic or Hebrew; one can see the problem. However, the kids seem to be able to connect with us interns despite the large language barrier. Although we are not equipped with the ability to verbally communicate with the kids, we are easily able to laugh and play and dance and sing. One young girl spent a solid thirty minutes with me, asking me to spin her around and sing Moana to her. Kids are kids. Arab, Jewish, or otherwise. They all just want the same thing, which is to play and have fun. Despite how much I am enjoying and learning from my time at Beit Ha’Gefen, this summer for me is also about more than solely the internship. It is about being in Israel; being immersed in Israeli culture; getting to know the food, the people, the language, questioning everything and deepening my relationship with this country full of its complexities and beauty. Through my internship with Beit Ha’Gefen, and furthermore, through being in Israel and traveling, I see myself achieving these goals that I had set for myself. Over the last few weekends, I have visited friends in Tel Aviv and gotten to experience the beautiful beaches and lively city. 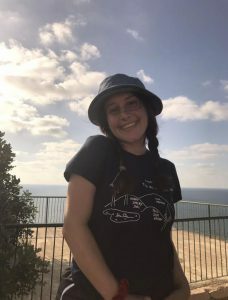 I have also taken a day trip to Akko, gone on hikes and to the beach, and explored Haifa with the new friends that I have made on my program. I am planning on traveling to more places in Israel in the second half of my trip and am looking forward to continuing to explore and to continuing my work and learning with Beit Ha’Gefen. I am very grateful that I have four more weeks in this beautiful country and I cannot wait for all that is to come.